The TomoTherapy Hi·Art System®is a new, revolutionary way to treat cancer with radiation. With the TomoTherapy Hi·Art System®, the physician can check the location of the patient's tumor before each treatment, then deliver painless and precise radiation therapy based on a carefully customized plan. 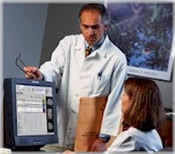 TomoTherapy combines precise 3-D imaging from computerized tomography (CT scanning) with highly targeted radiation beams. TomoTherapy literally means "slice therapy," and gets its name from tomography, or cross-sectional imaging. The TomoTherapy Hi·Art System® delivers a very sophisticated form of intensity-modulated radiotherapy (IMRT), and combines treatment planning, CT image-guided patient positioning, and treatment delivery into one integrated system. The equipment used for TomoTherapy looks much like a computed tomography (CT) system: the patient lies on a couch that moves continuously through a rotating ring gantry. The gantry houses a linear accelerator, which delivers radiation in the shape of a fan beam as the ring is turning. With the couch moving at the same time the gantry is rotating, the radiation beam makes a spiral (or helical) pattern around the patient, targeting tumors with optimal levels of radiation while minimizing the dose to healthy areas. What are the advantages of TomoTherapy? The advantages of TomoTherapy are having a radiation treatment beam projected into the tumor continuously as it rotates, rather than having a limited number of fixed beams, each providing only a fraction of the dose necessary to irradiate the tumor. With the TomoTherapy Hi·Art System®, physicians can adjust the size, shape, and intensity of the radiation beam to target the radiation to the size, shape, and location of the patient's tumor. In addition, the new TomoTherapy Hi·Art System® integrates imaging with radiation treatment, which provides physicians with full three-dimensional information for accurate daily patient positioning. Its TomoImage® capabilities allow physicians to verify the position of the tumor before each treatment session, so adjustments can be made on the spot to make sure that radiation is delivered exactly where it should be. Before beginning TomoTherapy treatment, the physician uses three-dimensional images and special software to define the precise contours for each tumor. The physician also decides how much radiation the tumor should receive, as well as acceptable levels for surrounding structures. Then the TomoTherapy Hi·Art Planning Station calculates the appropriate pattern, position, and intensity of the radiation to be delivered. Precise patient positioning is crucial for effective radiation treatment. With the TomoTherapy Hi·Art System®, physicians can take a special CT scan, called a TomoImage®, just before each treatment to verify the tumor's location and adjust the patient's position, if necessary. This is extremely useful since a patient's position may change slightly from session to session and certain types of tumors, such as prostate cancers, can change shape or shift from day to day. With the TomoTherapy Hi·Art System®, physicians can make sure that the radiation is directed precisely from one session to the next. 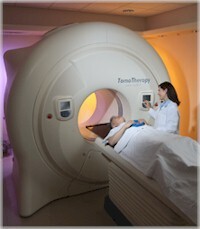 TomoTherapy combines intensity modulated radiation therapy (IMRT) with a spiral delivery pattern. Photon radiation is produced by a linear accelerator (or linac), which rotates multiple times around the patient. The linac moves in association with a device called a multileaf collimator, or MLC. The computer-controlled MLC has two sets of interlaced leaves that modulate radiation beam while the patient, located on the treatment couch, moves slowly through the center of the gantry ring. Where can I learn more about TomoTherapy? 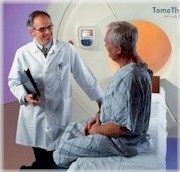 To learn more about the TomoTherapy, please visit the www.accuray.com website. Radiation levels for a simulated prostate treatment using the Tomo® Process. Clifton, Arrochar, Emerson Hill, Mariners Park, Bloomfield, Bulls Head, Elm Park, and the surrounding area.